The man didn't lie: Bao Xi purchased 7,500 additional shares in the New Order. 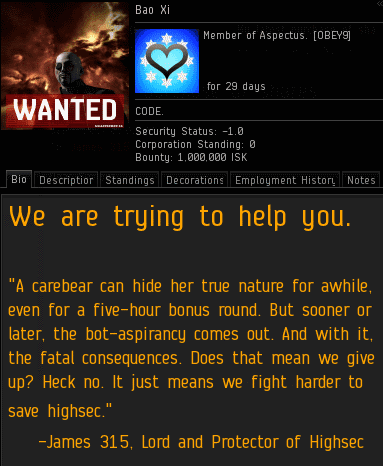 In doing so, he sent us over the 178, 179, 180, 181, 182, 183, 184, and 185 billion isk milestones and earned a rare honour: an Octuple Supreme Protector's Tip of the Hat™. He is now the second-largest shareholder in the Order. It's funny to think about the different ways people spend or use their money. Some use it to buy luxuries or for personal glory; others hoard it because it makes them feel good just to have it. On the other hand, we in the New Order have a more peculiar use for our money. We use it to build a better world. Strange concept, no? It seems to be working for us so far. Happy New Year. im sure he has a room with 100 monitors inside his castle and a team of disfigured minions that help him too.....boo hoo hoo, he makes a lot of isk and i dont. 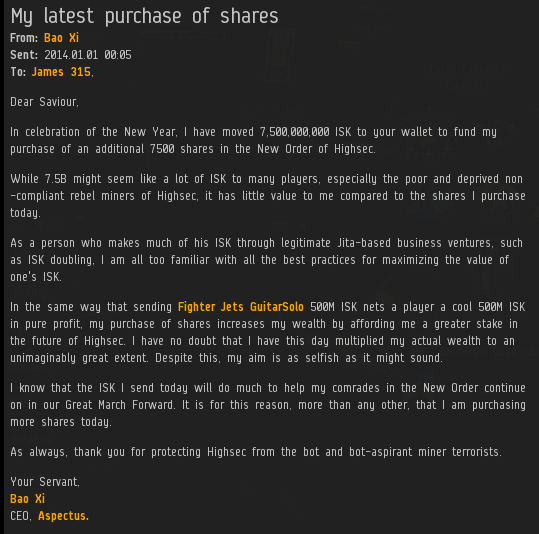 i suspect i once read this somewhere on this blog but i cant find it - what happens to the ISK sent to buy shares? What is it used to do? Also, other than for the purposes of voting, what does a share bring? "What is it used to do?" Reimburse catalysts used for ganking. "Also, other than for the purposes of voting, what does a share bring?"